A new book from Nina Khrushcheva and Jeffrey Tayler takes readers on a tour of Russia under President Putin. Knowledge@Wharton: This idea that Vladimir Putin had of making this trip in one night — was that an incredible task to try to pull off? Nina Khrushcheva: Well, we know Vladimir Putin. We’ve seen him in action. He’s a little bit of an exhibitionist, a lot of an exhibitionist. He wanted to present himself and the country as something special because in the Boris Yeltsin years — the first Russian president after the fall of the Soviet Union in 1991 — Russia took a little bit of a beating from the West. It lost the Cold War, and Russia did feel humiliated. When Putin came in 2000, he said, “It’s a great country. We have 11 times zones. It’s all incredibly diverse, and we really need to show it not only to the world, but more importantly for the Russians to make them feel better.” It was supposed to be a promotional exercise, but it was also to tell the Russians that they are not a punching bag of the West in many ways. Of course, you can’t really make that trip in one night because you can’t do it in a magic sleigh. It’s just too big to go this way. We thought it was an interesting idea to travel through Russia. We obviously couldn’t do it in one night, and we couldn’t do it in winter all the way through because some parts of it are way too cold to travel to as regular people. But we thought it would be remarkable to see how Russia changes, or doesn’t, when you go sequentially from time zone to time zone. Knowledge@Wharton: The size of the country plays a role here, correct? What may be happening in the eastern part of the country could be significantly different from what’s happening in the west, closer to Europe. Khrushcheva: One of the closest to Europe — it is in Europe — is the city of Kaliningrad, which used to be a German city of Königsberg until the end of World War II, until 1945. That is a German city with a German culture that suddenly became Soviet. With the Cold War raging after World War II, first Joseph Stalin and then subsequent leaders of the Soviet Union made sure that very little German culture remained in that former German city. Putin comes in. His first wife was from Kaliningrad, so he is a German speaker. His German is very good. He was stationed in Germany in the KGB for an intelligence operative in East Germany, so he took it upon himself to bridge the German and Russian culture at the time. It was supposed to be a litmus test of whether Russia can or cannot be Western. There’s a lot of Germanic feeling there, and their most celebrated person is Immanuel Kant, the great German philosopher. He’s essentially the Lenin of Kaliningrad. Then you go all the way to Vladivostok on the Pacific Ocean, on the other side of which, as you remember, [vice presidential candidate] Sarah Palin memorably thought she sees Russia from her backyard. We went all the way there. South Korea and North Korea are very close. Japan is very close, and Moscow is much further. Moscow is an eight-hour flight from there, while Japan is an hour-and-a-half. So, it does create a different kind of mentality. We would say Vladivostok is the most cosmopolitan city of Russia because they do have this somewhat European identity that the western parts of Russia have, but also very much aware of the eastern presence. 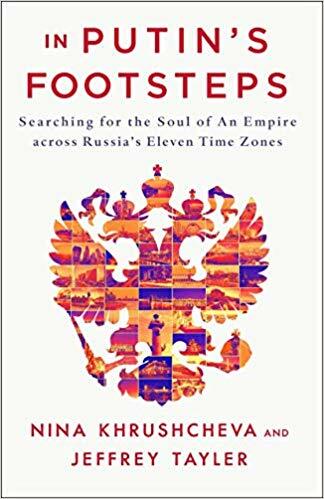 That in itself was something that is sort of bigger than anything the world understands about Russia — that it is a diverse and the largest country in the world, and it identifies itself as such. Knowledge@Wharton: How would you describe the state of the Russian economy? Khrushcheva: The Russian economy is not doing as badly as the United States says it is or thinks that it should be after the five years of Western sanctions. It even has some growth, up to 2%, in fact. It could have done better, but that allows Putin to continue with his messages that, despite all the hardships that the West imposes on us, we are going to persevere and be a great country. That message worked well enough until the end of the summer. After that, there was a pension reform. At the end of summer, there was also the World Cup, which took place in Russia across many cities. That was another wonderful thing that people actually saw, that Moscow is much bigger than just the Kremlin or just Moscow or just St. Petersburg. The World Cup was a very welcoming exercise for the Russians when they didn’t bomb anything, they didn’t invade anything, and yet they didn’t win anything. They were wonderful hosts, and that made them understand that the Kremlin is not necessarily needed to make Russia great. So, Putin’s approval rating took a beating, and the economy is slowing down because of all the big projects, like the Crimea Bridge that was built between Crimea and Russia. Crimea is not connected by land to Russia, even though it was annexed from the Ukraine in 2014. The state is looking very hard to see how it can coach the economic slowdown. I wouldn’t really put it past Putin to start building up the militaristic rhetoric, which they’ve already been doing, because the United States is withdrawing from a variety of agreements and sanctions not being lifted. That part, probably Putin is going to be using. But for the people now, I think the bridge is a much more important kind of definition of their greatness than Putin’s role. It would be very interesting to see how these kinds of tensions develop — the tension between the great politics or international adventurism. Knowledge@Wharton: Other than Vladivostok, did you visit other cities where you saw great change or development? Khrushcheva: We talk about the Kremlin all the time and talk about Putin all the time and how miserable the country is, but it’s actually not true. In the 19 years that Putin has been in charge one way or another, cities have become much more comfortable. And the World Cup experience showed that [Russians] are much more comfortable than they ever were before. Vladivostok developed because he built three bridges in the space of five years. There were bridges and roads, for example, that we described. We traveled on the road in the far north to the city of Okhotsk, which was the Gulag town. The center of Gulag was created to be the center of detention camps and forced labor in the far north, where they even have a Gulag song of the kind that says, “Ten months of the year is winter, and only two months is the summer.” It’s incredibly cold, even in the summer. They had this Kolyma Road that would be associated with prisoners walking the road, and the roads were horrible and frozen and muddy and completely undeveloped. Now, it’s the Kolyma Highway, which is mind-boggling. I grew up in the Soviet Union. For me, the Kolyma Road is kind of an epitome of the horrible plight of political prisoners in first the czarist era, and then the Stalin era. And suddenly, it is much more than that, and it’s actually a road. Tangible things have been built, and this is something that Putin, the federal government, essentially did. It was, “We’re going to create these kinds of amenities that any normal country should have, without claiming absolute greatness.” But it did. Then the governors would take care of little things, so there would be no protests, there would be no opposition because suddenly people got roads. They got bridges, they got business centers, cafes, restaurants and so on. Knowledge@Wharton: There have been many stories over the years about how cities that see economic growth because of events like the Olympics or the World Cup experience a withering afterward. Is there a concern about that kind of decline after the 2018 World Cup in Russia or the 2014 Olympics in Sochi? Khrushcheva: There is a distinction between the Olympics and the World Cup. The Olympics, of course, was pre-Crimea. It was supposed to be the big Putin story that we are capable of having the whole Olympics hosted not just in the center, but once again, somewhere else. And Sochi is a summer place, so you really don’t want to have a winter Olympics there. That in itself was a contradiction. People like me were saying that when Putin would be forbidden from going anywhere politically because he would be such a pariah in the world, he would have to have his own ski resort in Sochi. So yes, it was a show-off. It was one of those Russian things when you have a five-year plan in two years or something like that. It’s to show to the world, and then nobody came. If you remember, foreign leaders sort of snubbed it, and it was a big scandal even before it was a big scandal with doping and what not. With the World Cup, it was done more smartly. A lot of local interests were in part of the developing of it. Certainly, the stadiums in Russia will be used because there is a lot of football activity, soccer activity going on. Putin’s a smart man. He learned from that experience in Sochi, and they actually created something that is more livable and more useful during the World Cup. It was unlike the Sochi Olympics, which was a Putin game and a disaster. The World Cup ended up not being Putin’s game. It was the people’s game, and it ended up to be so successful. Knowledge@Wharton: How does the economy continue to grow? Khrushcheva: Oil is a very big piece to it. Russia’s economy, given its potential, is tiny. I think it’s the 12th or 13th of the world, after Italy. So, let’s just not be so excited. There is growth, but it’s nowhere near where it should have been. It grows because of the land. Of course, there is oil and gas. Russia has been quite prominent in it, even diversifying those who receive Russian oil and gas. For example, China is now a recipient. Even with sanctions, there is still a developing category. But Russia also is incredibly rich in natural resources – the diamonds, the amber. Kaliningrad, I think, is the first producer of amber in the world. Then there are diamonds and gold and whatnot in Yakutia — in the coldest place in the world. That’s that Kolyma Road, where people were digging for gold and have been digging for gold until today. Copper, aluminum, all these things are there. One of those unintended consequences of the sanctions is that the things that Russia was buying in agriculture from Turkey, from Europe, from China, they’re doing it themselves now. Because when sanctions came in, Putin said, “We’re going to pay you back, you horrible Western world and not-so-Western world. We’re not going to buy your agricultural products. We’re going to do it ourselves.” So, they started doing it themselves. Suddenly, you have cheese that you’ve never had in Russia before. It’s amazing. You have yogurt that you’ve never had before. You have meat that the Chinese are now buying, because this is something that Russia can do. I mean, it is a talented country. That’s why I’m saying it’s such a shame that it’s only 13th or whatever in GDP in the world, because it could have grown much faster. That idea of grandiosity and size really gets in the way of a lot of normalcy, as Russians would say. Even though under Putin, they’re much more normal than it ever was before. Knowledge@Wharton: In the book, you describe Kiev as “the mother of all Russian cities” and say it has the potential to be a threat to “Mother Russia.” Take us into that chapter and what you mean by that. Khrushcheva: Kiev is the mother of all Russian cities, the beginning of Russian and Ukrainian culture in many ways. The reason we put it in the book is because, of course, Kiev is in the Ukraine. Clearly, it’s not a Russian city. But it is such an important city for understanding of Putin’s agenda. Crimea was Ukraine’s property. And then Putin said, “Well, it was all Russian before, so we should take it back” in 2014. Kiev is an incredibly important place of where the seat of power began, where Russian Christianity began in the 900s. One of the stories that we tell is about a very important statue in Kiev, which is St. Vladimir with a grand cross, baptizing on Russian land. It was built in, I think, 1843 by a Russian emperor, Nicholas I. When the Soviets came in, they destroyed all references to the old regime, so most of the statues to the czars were destroyed. That one was kept in because it was such a great imperial symbol of uniting all the Russians, of showing what the Great Russia is. Even more ironic, it was renovated in 1953 by Joseph Stalin, who died in ’53, so he didn’t really live to see the renovated Vladimir. When Russia annexed Crimea, Putin decided he needs his own Vladimir because he can’t take the Vladimir from Kiev. So, they built their own grand Vladimir, also with a grand cross. Even those baptismal histories become a matter of confrontation between Russia and Ukraine. And what was really interesting in the Ukraine, they now destroyed all their Lenins. They had a lot of Lenins before, and they destroyed the references and the monuments to Lenin. The drama of this — who was the first Christian? Who was the first Russian? — is raging on between Russia and Ukraine, not only in Crimea or East Ukraine, but also in those cultural references and symbolic statues of previous emperors. Closer U.S.-Russia ties under the Trump administration could provide investment opportunities for some U.S. firms. But is Russia under Putin too risky a proposition?